The Deputy House Minority Leader, Hon. Onyema Chukwuka has declared that some Senators were planning to break into the Senate chambers. He stated this in a video interview which he granted while on what he called a vigil at the National Assembly Complex. Senator Chukwuka alleged that they had it on good authority that some APC Senators led by Ali Senators Ndume, Senator Adamu Abdullahi and Senator Omo-Agege. According to him, their aim was to sit illegally while the Senate was on recess and impeach the Senate President Bukola Saraki. He stated they had tried to break in earlier and were coming back this night (2n August 2018) and tomorrow morning. He added that this attempt was aided by the Nigerian security forces. 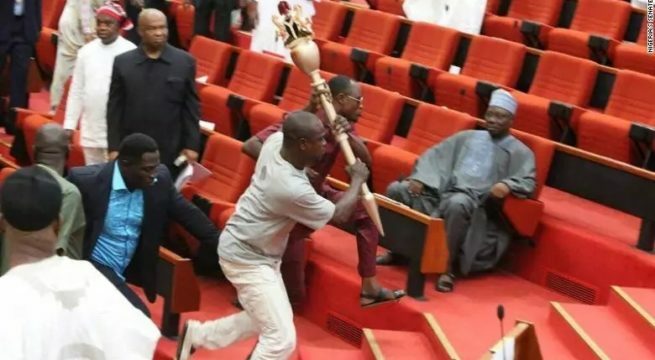 As a result of this, Senators in the PDP caucus decided to hold a vigil at the National Assembly to see what happens. He noted that this was an attempt to repeat the illegality which occurred in Benue state where 8 members of the state Assembly attempted to impeach the governor. He called on Nigerians to stay awake with them because this was not just an attempt to take over the National Assembly but an attempt to truncate our democracy.